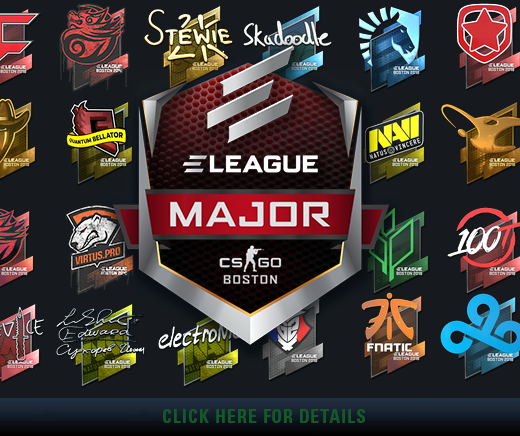 The Boston ELEAGUE Major is just weeks away. On January 12th, watch as the top teams in CS:GO battle for the title of CS:GO Major Champion! You don’t have to wait to start supporting your favorite teams and players. Team stickers, player autographs, and team graffiti are all available for purchase in-game or from the Steam Community Market, with 50% of the proceeds going to players and organizations. You can use Team Stickers as game pieces in the Boston 2018 Team Pick’Em Challenge. For the first time you can make picks for the Preliminary Stage, predicting the teams that will advance to the Group Stage, as well as the most (and least) successful teams. You can make your second set of predictions before the Group Stage begins on January 19th. Then, put together your bracket and make your Playoffs picks before January 26, predicting the Quarterfinal, Semifinal, and Grand Final winners. Follow the tournament and see how well your predictions turned out as you earn points toward an Boston 2018 Team Pick’Em Trophy. Get in the spirit! Make your picks and show off your favorite teams, the next CS:GO Major is just around the corner.